Well let’s just go ahead and open with a strong statement: I’ve been skiing the MOMENT PB&J since May, and it has already become for me a serious contender for the best ‘one-ski quiver’ on the planet. Normally, when talking one-ski quiver, I tend to think that 110mm-115mm underfoot is sort of the sweet spot. At that width, if the ski’s flex is dialed, you’ve got a shot at a ski that can handle hard stuff pretty well, yet still provides enough surface area to float in deep snow. At 101mm underfoot, the PB&J is slightly narrower than my ideal do-everything ski, but the PB&J performs so well on hardpack, chop, frozen chop, powder, bumps, trees, straightlines, and a foot or two of fresh, if you are looking for one ski to try to do it all, the PB&J ought to be on your short list. Jonathan Ellsworth, Pala del Vulcano, Las Leñas. This past spring, Rom Marcucci at MOMENT described the PB&J to me as a “skinnier Bibby Pro.” This was a very risky way to put things, because I love the Bibby Pro. If the PB&J turned out to be some softer, more intermediate-oriented park toy than the Bibby, I was not going to be happy. I got a number of days this spring at Arapahoe Basin, skiing the next best thing to powder: SLUSH BUMPS. My first run on the PB&Js was down the skier’s right side of Exhibition: low angle bump skiing with nice lines. The skis were great, and felt as good in the bumps as the 186cm Rossignol S3s (the S3 measures closer to 183cm tip to tail). With its centered mount, the PB&J is a super pivoty ski, which was nice, given its relatively long length for bump skiing. Heading over to Lenawee chair, we ripped Powerline down to the Treeline Terrain Park. The PB&J felt very stable in the slush, no speed limit, though certainly not as locked in as their non-tail rockered relative, the MOMENT Belafonte (even the 182cm Belafonte.) There was no washing out on any of this stuff, but again, we were skiing beautiful spring slush. Get these on steep ice, and that rockered tail isn’t going to help the skis track. Airs off of the top of Cornice run felt good, and I was impressed at how well the PB&J handled the slushed up chop of King Cornice, West Wall, and Wildcat. MOMENT built the PB&J with a symmetrical flex to up its park game, but I found the relatively stiff flex to be just about perfect for landing airs and tracking well down chopped up snow and wet fresh. After a number of days at A-Basin, I took the PB&Js out to Utah to ski over the 4th of July. On this most American of American holidays, the PB&J raised an interesting question: What’s more American than apple pie? If anything, peanut butter and jelly. Skiing at Snowbird, we were beyond spring conditions and into full on SUMMER conditions: super slush, thick, puddly, and slow. The snow was definitely grabby, and there were lots of transitions from firmer snow in the shade to wet, peanut butter snow in the sun. People were getting bucked around pretty good, but the PB&Js definitely evened out the ride and made for an outstanding long weekend. Jonathan, again, congratulations for the review. 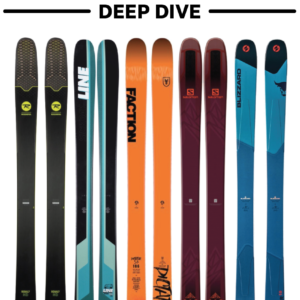 Oh man, big question arises to me now that you´ve made this review about the PB&J…I was decided to go for the Belafonte as I´m an agressive skier and love dropping cliffs and what I need is a ski that can handle everything, variable conditions, ice, pow, chop…. I was looking for a freeride ski that could perform as good as possible on groomer and this ski is gonna be my only ski quiver. I also opted to go for the Belafonte because in other review I read from you, you said that the Belafonte will make me a better skier (I already consider myself a good skier, I´m 23 now and started skiing at 10) as it doesn´t forgive. But on the other hand you only say good things about the PB&J and is more versatile so it becomes is a serious good competitor as a “one ski quiver”. So that´s it that´s all, oh, in your Belafonte review you also said this ski was ridicously fun on groomers…could you compare it to the belafonte?so…if you were on my shoes…what would you do? Hey Jaime! Good to hear from you again. Alright, Belafonte vs. PB&J: The Belafonte is the better groomer ski. The PB&J is really fun on groomers, especially soft groomers. But when things get really firm, the tail of the Belafonte will lock you in to a turn better than the PB&J. I would rather ski the Belafonte in chop, too – it’s even more stable than the PB&J in that stuff. The PB&J is easier to ski than the Belafonte, it’s more forgiving. On a deep day, I’d probably take the 188cm PB&J out over the 182 Belafonte, just because of the PB&Js tip and tail rocker. But our reviewer Garrett Altmann skied the Belafonte in deep snow and liked it, and if I remember correctly, he weighs about the same as you. To me, the PB&J is easier in bumps, but I think you’ll get used to either. 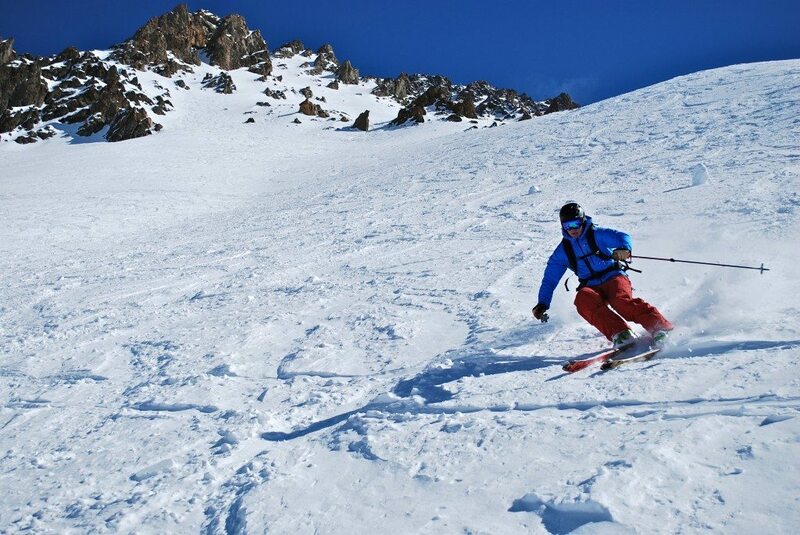 If you’re really skiing hard and dropping cliffs, both skis can do the job. But the more concerned you are with groomers, variable conditions, chop, and ice, that all points toward the Belafonte. The more emphasis you place on soft snow performance, “playfulness,” and a good mix of stability + forgiveness, then it would sound like you’d be leaning more toward the PB&J. Awesome Review! I think I’m going to end up getting these but Im stuck between the 182’s and the 188’s. I am 6ft, 160lb and probably around the advanced/expert range. I currently ski a pair of non-rockered 180’s. My worry is that the 182’s might be too small to charge big lines, while the 188’s might be too throw around in bumps. What are your thoughts? Hey Jordan – ultimately, it’s going to come down to the question: What’s your priority, big lines, or bumps? If big lines, then 188, no brainer. If bumps, then 182, no brainer. Where do you ski? If you ski bumps 90% of the time, and get to bigger mountain stuff 10% of the time, I’d go 182. Also, a straight tape pull measurement on the 182 PB&Js is 180.5cm, almost exactly the length of your current skis. The 188cm PB&Js come in at 186.3cm, a whopping difference of 6 whole centimeters. 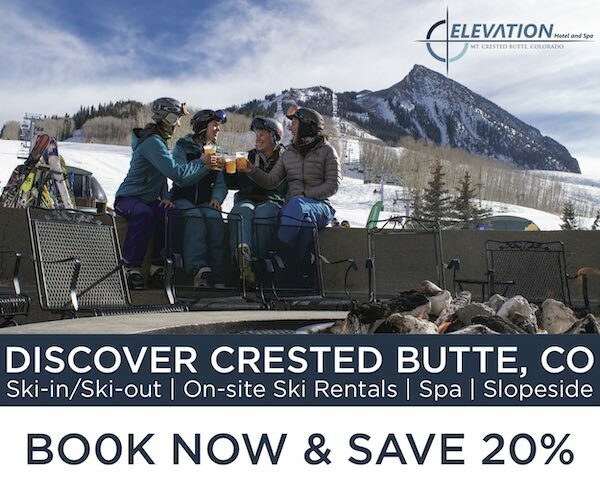 My point is, it sounds like you’ve identified the ski you want, so I would think about the terrain and conditions where you’ll spend the majority of time on these skis, and let that make the decision for you. Of course, you could also just flip a coin, too. Let me know what you decide to do, and how it works out. I ordered a pair of 182’s this afternoon. Thanks for the help! Nice, Jordan. Let us know how those 182s are treating you. Just wondering, did you mount these ski’s on the factory recommended line or did you move the bindings back a little bit?! Hey Josh, I mounted mine 1cm back from the factory recommended line. “My take on this is that somebody who was going to hit the flippy / spinny stuff hard could move these forward 1 or 2 cms from my line [so just to be clear, 1 cm forward of my line = factory recommended] and be fine. For more directional skiers, I don’t think these need to get mounted further back. Great review! I would love however, if you had one of your “2nd looks” at it and had someone take it into the park for at least half a day. They do say on the ski’s description that it can slay park so id like to know if there is any truth to this…seeing as i am a park skier who is in search of a one ski quiver. Thanks, Brian. I didn’t mention it above, but our reviewer Andrew Gregovich did, actually, have the PB&J in the park for about 1/2 a day this spring. He definitely felt like the 188cm was a lot of ski, so my comments in the review reflect that initial impression from Andrew. But even if Andrew is right, it still leaves the question of the 182cm PB&Js park chops, which is frankly just a more appropriate park length anyway. Even so, we’ll definitely get a fuller report soon on the 188’s park performance, and hopefully can do the same down the road with the 182. I am trying to decide if these will be good as a backcountry ski (mounted with fritschi AT bindings). Specifically, the tail rocker seems like I’ll lose a fair amount of skin contact with the snow, making skinning more difficult. 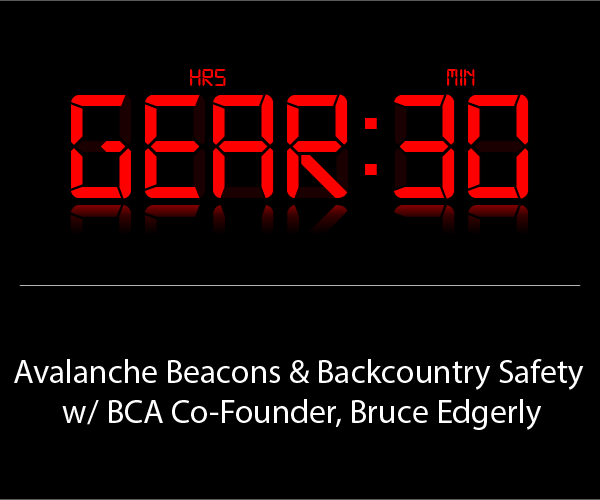 Do you think the Belafonte is much better for backcountry? I generally like a bit smaller of a turn radius than the Belafonte offers, making it a bit more playful, easier to get around. Any suggestions on other skis I should be looking at in this 105 underfoot-ish range? For most people, the Belafonte probably isn’t best described as “playful”. It has no tail rocker, and very subtle tip rocker. I love the Belafonte, but it is a stiffer, more conventionally shaped ski, flotation isn’t it’s strongest suit, maching through chop is. You’ll have to decide how much of a detriment the tail rocker of the PB&J is for skinning. If you’re going with the 188cm, unless you are laying down really steep skin tracks, I wouldn’t be too concerned. The new DPS Wailer 99 has a really nice tail shape, and relatively subtle tail rocker. Might be worth a look. Thanks for the reply. I decided to go with the 182 PB&J. Hopefully not too much skin traction will be lost with the tail rocker. I was hoping for some advise on mounting position. I barely ever ski swtich, and never land jumps switch. I’ll be touring/resort about 50/50. I’m thinking I don’t want true center of the ski. Do you know what the recommended binding mount is for my habits? I think you would be fine on the factory recommended line, there’s no need for you to move closer to true center. So I bought a pair of Line Elizabeths (110mm) after a trip out west having only brought my 86mm park skis and 130mm EP Pros (yeah, big gap – I know). I went with the Elizabeths because they were designed for park (which I ski 90% of the time), but their wide profile provide great float. Their flex pattern is also really soft, and at 135lbs ish, I’m light – so that suits me just fine. The problem is that their traditional camber profile makes you work to keep those tips up. What I need is a do-it-all, Swiss-army knife ski that I can bring with me westward along with my EP Pros for the backcountry deep (to which I have my touring bindings mounted). I’m looking for it to be able to rip the park, but when I want to explore the mountain, also give me some float with the 10-15cms of overnight, and do some glade skiing. I’ve ridden a ‘mustashe camber’ ski before (Armada JJs) and wasn’t actually a huge fan (lots of tip chatter), but could see their benefit. Should I stick with what I have, or trade in for the newer technology? Hard to say, Colin. You’ll definitely get less tip chatter on the PB&Js than the Armada JJs, but I can’t vouch for how much you’ll like the PB&J as a park ski. For “ripping the mountain” and giving “some float for 10-15cms” of fresh, the PB&J is perfect. But if you’re riding the park 90% of the time? Sounds like your best case would be to demo the 182 PB&J. If you can’t do that, you’ll have to decide whether or not to roll the dice. I am curious to how you would compare the stiffness of these to the ON3P Jeronimo. After reading this review I ordered a pair of 188 PB&Js from back country, but after hand flexing them returned them. I felt that they were too stiff for a soft snow/mild park ski, and would require a lot of effort to ski rather then a more laid back and playful ski. They seemed like an excellent hard charging ski however. I am a strong skier and at 6’2” and 225lbs I am familiar with stiff skis. How does the stiffness of the Jeronimo compare, and would you describe it as poppy and playful? I am looking for a ski for 70/30 all mountain/park duty which can take on harder packed groomers days after a storm. I am trying to decide between the 182 and the 188 PB&J. I am 6foot, 160lbs. And I ski pretty aggressively. Thoughts? Hi Alfonso, see my reply above in the Comments section to Jordan, who is exactly your height and weight. Cheers. Thanks! Just checked it out. Tough decision. First, I read on another site that the 2012 Bela is lighter and softer than the 2011 Bela. True? And do you know anyone that’s skied it and knows how the performance has changed? Second, if you were going to use one of these skis in the backcountry (50/50 backcountry touring vs. resort), would that make you lean towards one ski or the other? Any other comments/suggestions would be appreciated. Thanks! 1) The other website is wrong. I just reconfirmed with the VP of MOMENT that the Belafonte is unchanged from 10/11 to 11/12. 2) Personally, I would take the PB&J over the Belafonte as a backcountry ski, because if I’m skinning, I’m searching for soft snow, and the PB&J floats better than the Belafonte. If you are consistently skiing harder snow / hard chop in the BC, you might prefer the Belafonte. The Belafonte is amazing, but it shines at speed and in chop. The PB&J is a bit less stiff than the Belafonte, has tail rocker, has more tip rocker, and is a bit more playful. I love both, but for BC, I’m looking more for the qualities of the PB&J. I am interested in the PB&J and Volkl Bridge. I live in the East and spend three weeks out West. I like skiing the trees and the edges. My Western skis are Armada JJs, but I plan on bringing another pair when the pow is minimal. Which do you recommend? What length (Bridge 171 vs 178), (PB&J 172 vs 182)? I am 5’9″, 160 pounds, advanced/expert. 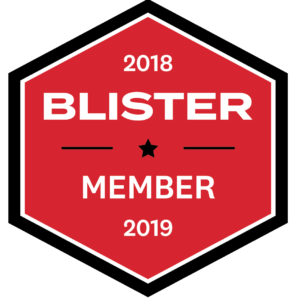 Alan – first, the easy question: at your height and weight, if you are an advanced / expert skier, I would definitely go with the 179 Bridge or the 182 PB&J – do not go shorter. The Bridge and the PB&J are quite different skis, and I haven’t skied the Bridge, and, unfortunately, Will Brown hasn’t yet had much time on the PB&J. It definitely seem like the PB&J has the higher speed limit, and I would take it in a heartbeat over the Bridge in chopped snow. My hunch is that the Bridge might be more fun in bumps. Long and short: the more you want to rage down the mountain, the more I would favor the PB&J over the Bridge. The more you want to be quick, have fun in bumps, and are skiing at moderate speeds, I think the Bridge will be a fun tool for the job. And BTW, we’ll be posting a 2nd Look review of the Bridge in a week or so, from a reviewer who is just about your size. Thanks for the great reviews! Do you have any thoughts about how the PB&J would perform as a tele ski? I have a pair of O1’s that I’m looking to mount on my “quiver of one” ski. Would your recommendations for ski length be different for using this as a tele ski? Thanks! Sean, telemark advice is something I should generally try to stay away from – but all of my tele friends agree that they like a somewhat stiff, and definitely supportive tail. And none of them ski shorter skis when they are set up for tele than they do when they ski alpine. Choose the size that you think would work best for you as a skier – not as an alpine or tele skier. On that note, no more tele advice from me re: PB&J vs. Belafonte. I will say that those tails are similar enough, I’d pay more attention to the fact that the PB&J is a rockered tail, while the Belafonte is a traditional twin tip. I am also curious about how the Belafonte and PB&J compare as tele skis. I read the comparison above — Do you suspect the points you make would be different if these skis are mounted tele? Great review! You guys haven’t tried the Armada TST by any chance? They have gotten some outstanding reviews on other sites and I’m torn between the two skis. 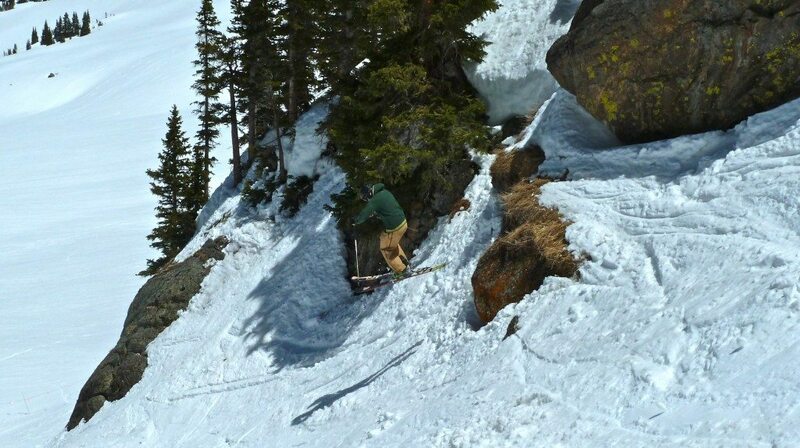 I’m 5’8″, 160lbs and skis mainly tight “under the lift” type terrain at WB as well as GS’ing soft moguls. The trick is I also like just pointing and shooting in the big bowls, and of course up here we get lots of “heavy west cost powder”. So essentially i’m looking for a ski that can turn on a dime (smear) in tight situations, but can also bust through the crud to GS soft moguls and chopped snow. Any recos for that one ski quiver from what you guys have tested? Hi, Mike. We haven’t skied the TST, so can’t help there, but I think the 182 PB&J could fit the bill for what you’re describing. Obviously, since the PB&J is only 101 underfoot, it’s specialty isn’t deep snow performance. And honestly, the Blizzard Cochise – if you can find it in a 185cm length – would be a slightly larger one ski quiver that could do what you say you’re looking for. Most advice I have read online about ‘mustache’ skis is to aggresively detune the tip and tail to a cm or two towards the middle past the contact points. Does this apply to the PB&J also? Tony, detuning really comes down to personal preference. I almost never detune skis right away, others detune pretty much the entire ski right away, and others will detune just down past the widest point of the tip and tail. The last practice is pretty safe, unless you’re in the park – then detune away. I say go ski them, and if they are feeling hooky or grabby, get a gummi stone and detune to taste. Continue to experiment if you wish, detuning and resharpening till you find edge nirvana. Thanks for the great review. I moved to CO last summer and just got back into skiing after a 13 year hiatus. It has been fun getting back out there. I purchased some all around skis during a Thanksgiving Day sale, and felt that I got a pretty good deal. But I came to find out that 1) what I purchased is the standard ski that is used at Beaver Creek for rentals, and 2) my friend that I have been skiing with pointed out that the skis were not as all around as I had believed (would not function well in powder). So bottom line I screwed up. As a result, I demo’d the S3 at 168 last Monday when Beaver Creek got 7″ of powder. There was a marked difference and I really enjoyed the skis. 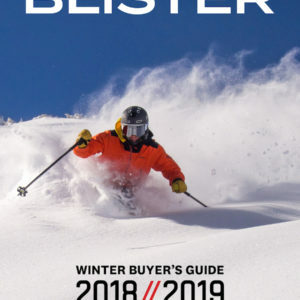 This experience has led me to look into picking up the right kind of “one quiver skis” that I was looking for initially. My friend recommended in addition to considering the S3 that I look at the K2 Kung Fujas, the Nordica Soul Riders, and the Moment PB&J’s. I stand 5’8″ and 175 lbs, so the Soul Riders seem like they might be a little long since the shortest size is 177. The Kung Fujas have some good reviews, but I don’t like the fact that the graphics apparently peel quite easily. The S3’s worked really well. Your review on the PB&J’s seems pretty awesome, and my friend thinks they would be the way to go. I get a little concerned because I don’t think I can demo the PB&J’s anywhere, so I was hoping to get some advice from some people that are not married to a particular brand – just believe in spreading the word on the best all around skis. I really want a great multi-purpose, all mountain ski that can serve as my one and done set for a few years. I will not be doing any park skiing, so I am not concerned about that. What would you (or anyone else for that matter) recommend for my situation with regards to the PB&J’s and the other three models mentioned? Thanks in advance for your consideration. I really want to get myself set up right. Hi, Adam – welcome back to skiing. We will be getting on the Soul Rider shortly, so we will be weighing in soon. But since you’ve already enjoyed the S3, I would consider it as a good choice for you (or it’s very similar sibling, the Scimitar – see our review). But seriously, consider the S3 (or Scimitar) in the 186 length. As for the PB&J, I love that ski, but I worry a little that it might be stiffer and a bit more difficult to handle, at least for a while. (And for the PB&J, I would recommend the 182cm length for you.) It is definitely a stiffer ski than the S3 – and that’s why I personally like it. But the s3 is more forgiving and incredibly easy. 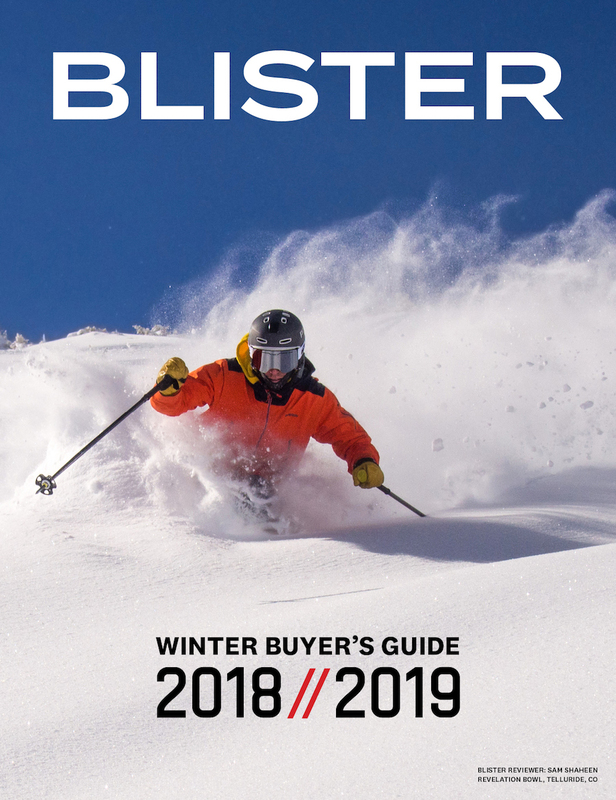 I think it comes down to this: do you want a ski that you will love right now (s3, 186), or a ski that will be very good right now – though occasionally perhaps a bit more ski than is comfortable – but a ski that you are not going to overpower / outgrow? Thanks for the great input, Jonathan. It is very helpful and much appreciated. I will definitely take your recommendation and ensure that I bump up to longer skis. I am looking forward to the Blister review on the Soul Riders, and I am also hoping to demo them this coming weekend. I have been able to log some good ski time in my return to the sport thus far this winter compared to the time that I put in historically. I also feel that I have improved a great deal in the time that I have been out on the slopes. It is a challenging predicament, however, that you correctly identified. On the one hand, there is the pull to ski something that is a great fit and I will love skiing right now (S3, 186). Additionally, is there something to be said with regards to getting more of my ski legs under me on a more comfortable ski before bumping up to something more advanced? On the other hand there is the desire to get something that will last me a long time to minimize my financial output for a while (PB&J), especially when considering that I already spent money on skis that I had hoped would fit this bill, but did not. This was my goal from the outset: a quality, all mountain ski that I could grow with but not outgrow. Coupled with this, however, is the potential issue that the PB&J may be bit much for me to handle for a bit as I continue to progress. Obviously having not seen me ski it is hard to estimate how much of an impact a more advanced ski like the PB&J may have upfront as I continue to get back into the sport. Do you feel that I would be putting myself at substantially greater risk (fun wise, safety wise, etc.) if I ultimately decided to go the PB&J route? If I try to log a bunch more mountain time over the remainder of the season (let’s assume 80% of the weekends between now and May), how realistic is it for me to accelerate my learning curve on the PB&J and get comfortable with it? Great review. I’ve now skied the PB&Js (based on your recommendation) at Taos, Alta, and Snowbird this season (mine are 188 with Rossignol FKS bindings). I have no regrets on the purchase. After getting the PB&Js tuned and waxed I took them out for a spin and found they are FAST. Great on the groomers and fabulous at GS turns. They are also great in the bumps – probably the first “all mountain” ski that I’ve really enjoyed making a zipper line through the bumps in. Mostly the conditions I’ve skied the PB&Js in this season have been packed powder with one day of fresh and relatively deep snow (while at Snowbird). I agree that they are a solid all mountain ski and are great for just about everything except deep powder. They are a joy in the bumps, fast on the groomers, and responsive in the trees and in up to 6 – 8 inches of fresh snow. I agree with your comment above that the Belafontes (which I also skied this season) are a bit more solid in the chop, which is my one (and only) complaint with the PB&Js. But I wouldn’t trade the playfulness of these boards for the stiffer ride of the Belafontes (or many other skis). Thanks for all the great reviews; they’re really helpful! I am in the market for a new pair of skis to replace my 166cm Armada AR6s. I am 5’9, around 145lbs, and I ski the east coast, mostly Vermont and New Hampshire. I ski trees whenever we get some snow, and hit cliffs and whatever drops I can find. But living on the east coast, icy days are a reality and I need a ski that can rip groomers and hit some park jumps. I like how light and poppy the AR6 is, but it is beginning to feel too flimsy and chattery at high speed, and I’d like skis that float a bit better. My friend has a pair of Kung Fujas’s which I tried, and they felt sort of dead and boring, not to mention heavy. So based on some reviews and looking around, I’ve been thinking that the Moment Tahoe might be the perfect ski: lighter and poppier than the PB&J, but still wide enough to be stable and float a bit. What do you guys think? You could try the Tahoe, Doug, but I can’t see taking them into the park. The Tahoe has been redesigned for 13/14, but the 12/13 is a pretty traditional ski with a bit of tip rocker. It might work for you, but I can’t say it seems like it would be an obvious fit. I’m also not sure that I found the Tahoe to be poppier than the PB&J…but it’s been a long time since I skied the Tahoe. Sort of wonder whether the Armada TST might be worth a look. Carves well, is definitely light, solid tail for landings, no tail rocker – just like the Tahoe. Seems like it might be a better fit for what you’re looking for. I am 6’1” and weigh 225, I am an intermediate/advanced skier. I am starting to venture off piste more and more but am still. a 60/40 . I live in in NV and mostly ski at resorts such as Heavenly and Kirkwood, I have some 184 Mantras as well as 185 Cochises. I was wondering if the PB & J’s would be a betterall around ski than the Mantras for my purposes ie. groomers, some trees, and some soft snowe occasional powder, and of course crud. I also go back east to the New England are and ski occasionally woul the PB & J’s work back there as well? You review sounds like this is an awesome ski for almost anything, would this ski be good givn my size as it has no metal? Also have been experimenting with some tele skiing, I bought a pair of K2 sideshows for that would the tahoes or PB & J suit this as well bearing in mind a beginner tele skier. Hey, Luis. Your Mantras will definitely provide better edge grip on groomers than the PB&J, though I bet you’ll find the PB&J to be more fun (and easier) off-piste and in moguls. The Cochise sort of falls between the two: I bet you find it better in terms of edge hold than the PB&J, but the PB&J is a more “fun” ski – more centered mount position, no metal, etc. The Mantra isn’t a “fun” ski – it’s a powerful ski that is fun the better your technique is. The PB&J would be more forgiving, and the Cochise would fall between the Manta and the PB&J on this spectrum. Beyond that, I can’t say much beyond my PB&J and Cochise review, but I hope that helps a little. Mostly, just don’t expect the tail rockered PB&J to rail groomers like your Mantras. Thanks Jonathan, sounds good. I think I will definitely run over to the Moment factory and get some PB & J’s thinking 188 cm. Might even get a second pair and throw some Hammerheads on them…! Thanks again! Intersting…I think you’ve caught me wishing for a ski that (maybe) doesn’t exist. I think that I want to err on the side of fun and poppy, just without being quite as noodly as my AR6s. Based on what I’ve read, despite being wider than the other skis I’ve looked at, the Line Sir Francis Bacon might be the perfect ski: able to rip some hardpack and park, super fun in the trees and soft snow. Am I crazy or could that be just the right ski? It’s definitely a fun ski. I usually prefer stiffer skis, but I had a lot of fun on the SFB. If Jason’s review of it sounds good, then I say go for it. Pulled the trigger on the SFB in a 184! Thanks for all the advice. I’m looking at the PBnJ and need a little advice. The three moment skis I’ve considered are the belafonte, PBnJ, and the deathwish. Im 6′ 200 and ski fast and aggressively. I, like all, want a great one ski quiver. I like to rip groomers and bumps, hit the side country on a pow day, and drop then rip. Based on your experience with these three skis what would you recommend? Hey, Matthew – given that we’ve written over 25,000 words (if you count the comments sections) and 3 reviews of each of these skis, I don’t think I can add anything new on the topic. But read the reviews and the comments section, figure out which tradeoffs you’re willing to live with, and I’ll be shocked if you’re still unclear on which way to go. Hi, im about 6″3/6″2 and weigh between 180/90 pounds. Would the pb&j be Long enaugh? Also im lookig for a ski in Addition to My Park ski and trying to decide! I dont get a Lot of POW days and lookig for a ski that is also Good in groomers and CAN be tanken into the Park. World you rather recommend the deathwish or the PB&J? After reading all the great Bibby vs. Billy Goat reviews, I’m stoked to see how the ON3P Jeffrey stacks up to the PB&J. Will you guys be getting on it this season? Thank you! Hey, Andy – we’re supposed to be getting on the 14/15 Jeffrey, probably later this spring or in the summer. Great review thanks guys! I’ve been skiing the 188 pb&j for the last season and love it. Mine recently had to be returned as they were defective. I’m looking for something to replace them. Buying a new pair of pb&js is certainly an option as i loved the stiffness, versatility, shape, durability of the ski. But i didn’t love the amount of tail rocker. What would be a similar ski with less tail rocker? Is the Belafonte what i’m after? And how comparable is the 187 Belafonte to the 188 pb&j? Whatever ski i get will be an everyday ski in Telluride for a strong skier and has to be able to handle pretty much everything except deep pow (i have a set of bibby’s for that). Thanks for any pointers and keep up the good work! But that’s just me. Our reviews will hopefully help you figure out if that’s you, too. Hey guys, having trouble sizing the PB&J. I’m 5’10 175 but just an intermediate skier. I live on the east coast and travel west a couple times a year. Looking to get a PB&J as a daily driver. Was thinking 182? Hi, Gabe – I’m very close to your height / weight, and I do really like the 188s. But if you’re worried about very tight trees or tightly-spaced moguls, I think you could get away with the 182s and find them to still be stable. But remember: these are pretty heavily tip and tail rockered, so these will ski significantly shorter than 182cm skis you may have been on that don’t have tail rocker (or perhaps tip rocker, either.) So just keep that in mind. I currently ski the Scott Punisher 189 and the Megawatt 188. I am looking for a ski for some groomers and a lot of time in the bumps. I am 6′ 4″ and 230 pounds. Looking at the Moment Tahoe, PB & J or the line Prophet 98 or a suggestion from you. I am a strong expert skier I do not jib. I ski Summit County and Vail. Hey, Jake – I suspect you’ll like the 188s in bumps. As for groomers, so long as you don’t expect the skis to react like a fat, flat-tailed ski – especially for really firm groomers – then I think you’ll enjoy them there, too. The non-tail rockered Prophet 98 will feel like the more traditional carver. I am thinking of buying the 2015 PB&J skis. I am a intermediate skier, have been skiing for 3 years, self taught. Im from CA, and I usually ski at Mammoth, Big Bear, go to Aspen once a year. Just want to know if this is the right skis for me. I usually stay on track, I am not an aggressive skier ( I believe Im not). I am skiing on 2011/2012 k2 Shockwaves. If these are the right skis, what length should I buy. Please recommend bindings as well! Best one ski quiver on the planet!!! Had posted this originally on the TST comments but have since decided to go with a PB&J so felt it was more appropriate here and am looking for some feedback on sizing vs. skill level. I’m 5’8″ 170lbs. Have been a boarder for a long time and now a recently converted skier and loving it. Am a intermediate skier. Unfortunately I only get in 10-14 days per season. 60% of the days are spent in Japan and the rest on the west coast. I avoid moguls and look for the powder/trees when I can. Enjoy the groomers and really letting it flow on those as well but wouldn’t call myself a hard charger or someone that likes ripping big mountain lines…yet. Haven’t done much backcountry but the side country in Japan is pretty amazing. Have been renting and want to buy my first pair. Don’t think I’ll build a quiver yet so looking to get one pair of skis for most of what I do and rent when I need to fill in other gaps such as if was really deep powder. As I progress, I’d like to take my skiing further into steeper slopes of varying conditions all over the resort and side country and hopefully more powder skiing. Had the opportunity to demo the 174 TST’s for 5 days this season in Japan. They were fantastic in the powder and handled the groomers extremely well, but felt like they struggled a bit more through the crud. Seems as if a lot of advice above is for the more advanced skier. My dilemma is that the pb&j has a moderately wide gap b/t the 172 and 182cm. Seems as if my riding style might be more suited for the 172 but a relative amount of preference for 182cm is given in advice above for more advanced skiers. Any thoughts on the sizing for my skill level? thanks in advance for all of the help and keep up the great work! Love this review! Thanks for being so awesome. I am looking to get new skis this year, and I’m looking strongly at the pb&j, the deathwish, or the peacemaker. My question is: do you think the pb&j’s would be too stiff for me? The reason I ask is because I weight <120 lbs, and I'm on the shorter side (about 170cm tall). I'd say I'm an advanced skier; I've been skiing as long as I can remember. My ski style is pretty aggressive. I love laying down hard carves on groomers at speed, but primarily I like to explore the mountain. Powder is great, but unfortunately I live in California, so most of my time on the mountain is spent in icy/slushy moguls, cruddy crud in the trees, icy steeps, flailing off small cliffs and occasionally playing around in the park. Looking for that magical one-ski quiver. As an aside, I haven't been able to find valuable info anywhere about how a skier's weight should affect ski length/stiffness in general; especially for an advanced skier like me. I'd love to see an article about that! So I am pretty sure I am going to get these but really can’t decide between the 182 and 188. I ski primarily east coast and like to go all around the mountain, lots of trees. I am just under 6 foot 1 inch and weigh about 175. I am just curious if the 188s will be manageable in the trees we have out here. That is my main concern because we go in the trees a lot. Of course the 182 will be more nimble but I just don’t want the ski to feel too short for me either. Right now I am on a pair of old (~08-09) 177 bridges which are full cambered and unless I am just casual cruising on a groomer they feel short ( I got them super cheap from a friend). Based on the wonderful reviews you posted last year, I spent a week in 2016 on the Nordica Enforcer 100’s and loved them in the 185cm length. Can you offer a quick comparison of this ski to that one? Thanks! So does this mean that the stamp on the sidewall of the ski is the point at which one should mount the boot midsole in order to have these be “all mountain skis”? In other words, the triangle represents the -5 cm mount point? I should note that on my 182 cm PB&J’s the tip-to-tail length is 180 cm, and the triangle is 85 cm from the tail. So it seems as though the triangle is 5 cm rearwards of the true center. Yep, the triangle = -5 cm. I have the pb&js from a couple years ago but I am assuming they mark all their skis the same. There is probably one big triangle and then two smaller ones on each side of the big one. The big triangle in the middle is “on the line” or in this case -5cm. So yes, you are correct. Hi! Just like you guys I have a almost unhealthy love affair with the old Bibbys (11/12). For this season I tried to add something new to my quiver because I now have to spend some time on the children slope and also wanted something that works a little better on hardpack/groomers. For this reason I got a pair of Navis Freebird. On the groomers and on the childrens slope they work really well. But as soon as I leave the groomers they are too soft for me. The width feels ok in pow but they are way too soft. This gives me too much pop and they are much too unpredictable in the pow for me. Now Im looking at the PB&J instead of the Navis. Will I get the same steady performance from them as I get from the old Bibby? Is a PB&J in 188 much nimbler to handle among the kids than a 190 Bibby? And last but not least, would I experience much better performance in the groomers than on the Bibby? Thanks again for this website and all your help. I’m about to get a set of PB&J’ but I’m torn between the 182’s and 188’s. My questions are actually based on the fact that I’ve never owned a full twin-tip ski before. Will the 182 be quicker to turn in the trees and bumps or will I be missing out a lot if I choose the 182 over the 188? Will the 188 make a much better overall ski for me all around in every condition? I love to play, hit small jumps, bumps, crud, and groomers when I ski with the wife. I’m 5’10”, 190lbs and an advanced skier. Thanks! Another thankyou; you guys help make skiing more fun :) I am not a ski guru so take the following with a hunk of salt: I just got some 188’s recommended mount; I felt very awkward initially (I have been skiing a 170 line blend), and I don’t really know what I’m doing tuning wise but I tried to detune to contact point with a gummy stone, and they felt much better to me (but maybe placebo effect). Had a fun day with some steep windblown crap at the top of Breck that they handled very well (blend’s would’ve been a floppy mess I think). I am still getting used to them but I feel like I am going to love them; I am learning switch and I was very pleasantly surprised that switch worked well on them for me. Not sure if they’re soft enough for me to butter (another thing I want to learn).